One of the most important things you can do for any brand of sewing machine is to keep it tuned up! And the best way to do that is to bring it to the TOP RATED AWARD WINNING SERVICE DEPARTMENT AT AN ABBEY SEWING CENTER NEAR YOU! The Top Rated Sewing Repair Service of Abbey is headed up by Steve Connelly. Steve is a member of three generations that were and are considered to be the best in the industry. 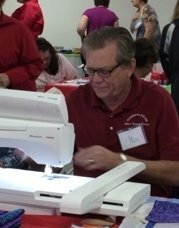 Steve has over 45 years of experience working on every brand and kind of sewing machine. His mother, Brooke, introduced Steve to the sewing industry and instilled in him a dedication to great customer service and the pursuit of excellence. Steve has passed that tradition on to his son, Steve Jr., who helps him daily. All of us at Abbey are proud to have had three generations of Connellys promoting Abbey Sewing Centers to one of the most awarded and authorized sewing service centers in America. Another reason Abbey Sewing Centers is always thankful for its great staff and wonderful customers LIKE YOU!